Never worry about a perp pulling away gear with a set of N01 Nylon Duty Belt Keepers from DeSantis. 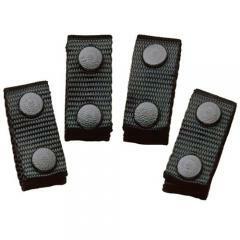 These keepers are designed to deliver an added level of retention between inner and outer duty belts. The keeper wraps around both belts and is locked into place with high-strength snaps. The keepers are constructed from military-grade nylon, making them flexible enough to be easily installed and strong enough to meet the demands of heavy tactical use. Available in both 2 and 2.25-inch wide lengths, these upgrades are able to fit virtually any police or security duty rig system.